Capacities are limited at each venue so if there is a band you specifically want to see please arrive early at the appropriate venue. 12 bands, 2 stages, 1 amazing day! This is Waiting For The Sun, Redcar's very own multi venue music festival in the heart of the town centre. Across 2 venues, Rosie O'Grady's (upstairs) in Queen Street and The Halt on Station Road, Waiting For The Sun will feature the cream of Teesside's music talent. For all the news and ticket updates checkout Sunny Days Events on Facebook, Instagram and Twitter. Tickets are limited so grab yours today! 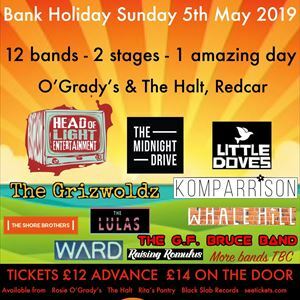 You can buy tickets online here or they are available at Rosie O'Grady's on Queen Street, The Halt on Station Road, Black Slab Records on Milbank Terrace and Rits's Pantry Micropub on The Esplanade.